Nowadays, there are a huge number of food and drink serving places in cities, serving various kinds of cuisine. These food and drink serving places offer a variety of different styles of service, including full-service, self-service, take-out, delivery, and so on. Under any circumstances, dining at food and drink serving places is not only an activity, i.e., eating that cannot be lacked from our modern lives in order to live, but also an activity where we organize special scenes such as happy events, funerals, farewell and welcome parties, and annual anniversaries. Furthermore, dining in food and drink serving places is also an activity where we talk to our family, friends, and colleagues and where we deepen relationship with them, which give us joy and pleasure much more than mere intake of nutrition. It can be said that whether business in the food and drink serving industry is good or not largely depends on the economic trend. People tend to less eat out and more eat at home during recession so as to reduce expenses of family budgets. In contrast, once business has improved, many people tend to dine in food and drink serving places at various occasions. 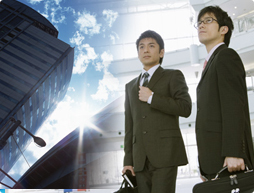 In recent years, Japanese business is improving thanks to the economic policy such as so-called “Abenomics”. Accordingly, severe situations of the food and drink serving industry are changing to the era of development. So now is a good time to enter Japanese food and drink serving industry. Our wish is to support those of you engaged in the food and drink serving industry who intend to develop your business by trial and error, and to assist your business in the field of intellectual properties. This page is intended to provide useful information, in particular, in the field of trademark. Trademarks for services of providing meals in food and drink serving places need to be registered under Class 43: “Services for providing food and drink”. This “services for providing food and drink” does not care about kinds of food and drink to be provided. That is, Class 43 is applied to all of Japanese restaurants, Chinese restaurants, European or American restaurants, and other ethnic restaurants. This “services for providing food and drink” neither cares about style of service to be provided, so “services for providing food and drink” are applied to service styles including service styles of family restaurants or general izakaya (Japanese-style bar) in which waitresses/waiters take orders at tables and serve food to the tables, service styles of hamburger shops and some cafes in which customers make orders at order counters and carry their food and drink to tables by themselves, and a service style, often found in pizza restaurants and sushi restaurants, in which food is delivered to orderers’ home. As to service of a food and drink serving place for which service a trademark is used, if kinds of food and drink provided in a food and drink serving place, and a style of service provided in the food and drink serving place should be clarified, for example, “providing food and drink of mainly… cuisine” or “providing food and drink in … (e.g., restaurant, cafe, or canteen)” is clearly described as a designated service. Currently, more than 500 designated services belonging to Class 43 can be found on the database. Services of “providing food and drink” in food and drink serving places are designated services belonging to the same class regardless of contents of the services. On the other hand, as we introduce on the page of “Advice for Those Engaged in the Food Industry” of our HP, in a case where food is sold as a product, a class of a designated product differs depending on what kind the food belongs to. This may be a problem for those engaged in the food and drink serving industry in a case where you sell your original product, for example, in front of a cash desk in your food and drink serving place. If you use the trademark of your food and drink serving place on the original product, it is necessary to register the original product as a designated product in accordance with the feature of the product, in addition to registration under Class 43. For example, in a case you sell a retort pouch product such as retort pouch carry or soup which is provided in your food and drink serving place, the “retort pouch carry” or the “retort pouch soup” needs to be registered under Class 29. For example, dressings belong to Class 30, and furikake (seasoned powder to be sprinkled over steamed rice) and pickles belong to Class 29. As such, it should be noted that, in a case where food is sold as a product, it is necessary to register the product as a designated product belonging to a class different from Class 43. Franchise business is familiar with the food and drink serving industry. Since franchise business is to give or obtain a right to use a trade name or a trademark and to exclusively sell products in a certain area, it can be said that trademarks are essential to franchise business. Organization and management of franchise business, provision of information about franchise business, etc. belong to Class 35. However, these designated services are applied to consulting service to the franchise business, and are not required for development of franchise business itself. Services provided in franchise food and drink serving places after all belong to Class 43. Therefore, in a case where a franchisee uses a trademark of a franchiser, it is necessary to register the trademark under Class 43 as explained in (2) above. That is, whether or not a food and drink serving place is a franchise is not a considerable matter in determining a designed service of a trademark. What is important for franchise business in terms of trademark is, of course, “whether trademark has been already registered or not”. In Japan, trademark right is given upon its registration. This means it is quite difficult to claim right of a trademark if the trademark has not been registered. Franchise business uses a trademark to show customers that a franchisee provides the customers with service whose quality is the same as that of a franchiser. It can therefore be said that the right of the trademark must be essentially reliable. What is meant by “the right of the trademark must be essentially reliable” is not only that application for registration of the trademark was filed and the trademark was successfully registered, but also that renewal is properly managed after the registration, which is quite important because trademark registration duration is 10 years (or 5 years if registration fee is paid in installments). The food and drink serving industry, which always searches for chance even in a difficult situation and provides us with new pleasure and joyful time, will be further developing in Japan and overseas. “HARAKENZO more” would always be pleased to assist those of you engaged in the food and drink serving industry with protection of your intellectual properties. Please feel free to contact us.